View of the ornamented backside of Jaisamand Dam. In southern Rajasthan, thirty miles south of the city of Udaipur, twenty square miles of the Aravalli Mountains have been flooded by the remarkable Jaisamand Lake, formed by the 1500-ft Jaisamand Dam. Tourist guidebooks frequently erroneously refer to Jaisamand as the second-largest artificial lake in Asia. This is far from the truth; in India alone, a half-dozen artificial lakes are much larger than Jaisamand. What is remarkable about Jaisamand is the combination of its size and its age. 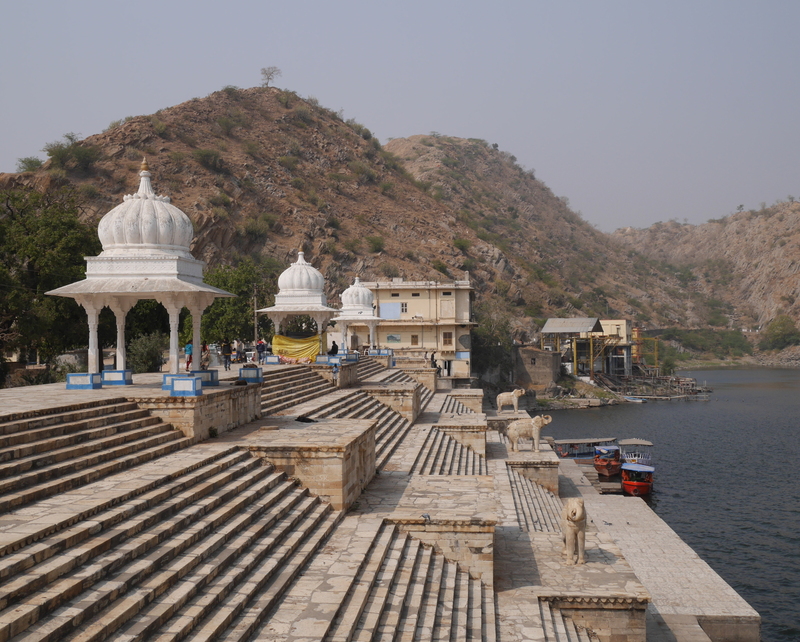 The lake was built in 1685 on behalf of Maharana Jai Singh of Mewar. Jaisamand holds the undisputed distinction of being the largest extant pre-modern artificial lake in India. Of the numerous Rajput kingdoms in medieval western India, Mewar was the last to submit to the Mughal Empire. 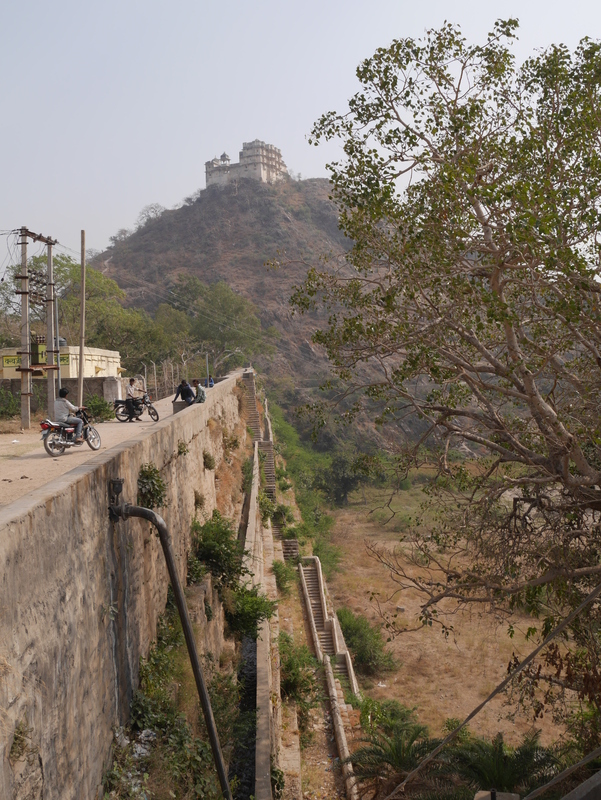 In 1568, Mewar lost its capital Chittaurgarh to the army of Akbar after a long and bloody siege, but a royal remnant escaped to found a new capital at Udaipur. The Mughals tried to defeat Mewar again at the epic Battle of Haldighati in 1576, but Maharana Pratap Singh escaped with his life and his kingdom. (Alas, Pratap’s horse Chetak succumbed to his injuries during the battle, but he has since become a local hero in his own right.) Finally, in 1615, after a series of battles, Maharana Amar Singh was forced to accede to the Mughal Empire. This was more than fifty years after Amber became the first Rajput state to join the empire. After getting dragged into the Mughal Empire, Mewar could redirect some of its resources from militarization to infrastructural development. Jaisamand Lake was one of the public works projects undertaken in the post-accession period. The lake stored water from the Gomti River, for use in irrigation. It also provided a setting for palaces and royal hunting reserves. Jaisamand Lake has changed a little since the late seventeenth century. The original dam was refurbished around 1960. During the refurbishment, the historic front face of the dam was covered by a characterless concrete facade. The crest and backside of the dam, though, retain their historical appearance. A series of white marble steps lead down to the water. There are six stone chhatris (domed pavilions), six carved marble elephants, and a temple, Shri Narbdeshwar Mahadev Jaisamand. Despite some graffiti on the elephants, and the usual litter, Jaisamand Dam remains a place of historical importance and real beauty. The steps on the backside of Jaisamand Dam. One of the chhatris on Jaisamand Dam. The white mark underneath the chhatri indicates the level reached by a flood in 1973. 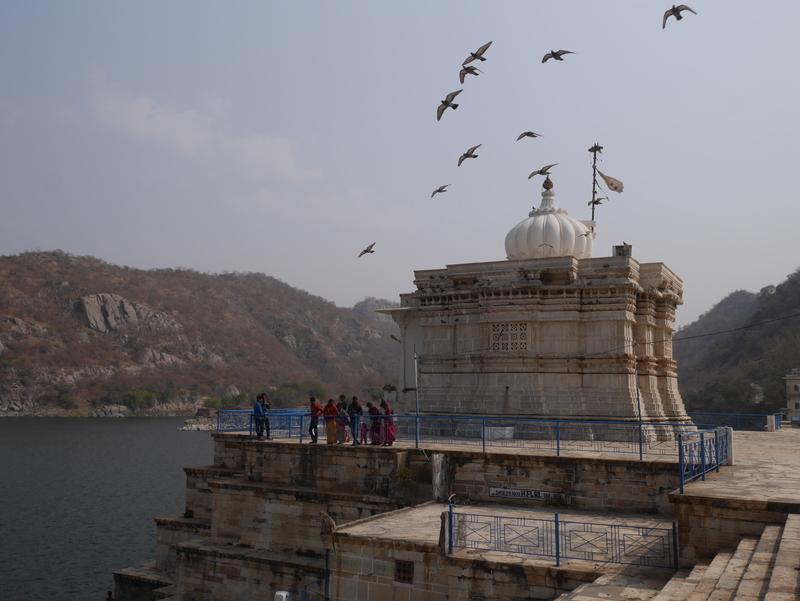 Pigeons fly over Shri Narbdeshwar Mahadev Jaisamand Temple, located front and center on Jaisamand Dam. The characterless concrete face of the refurbished Jaisamand Dam. 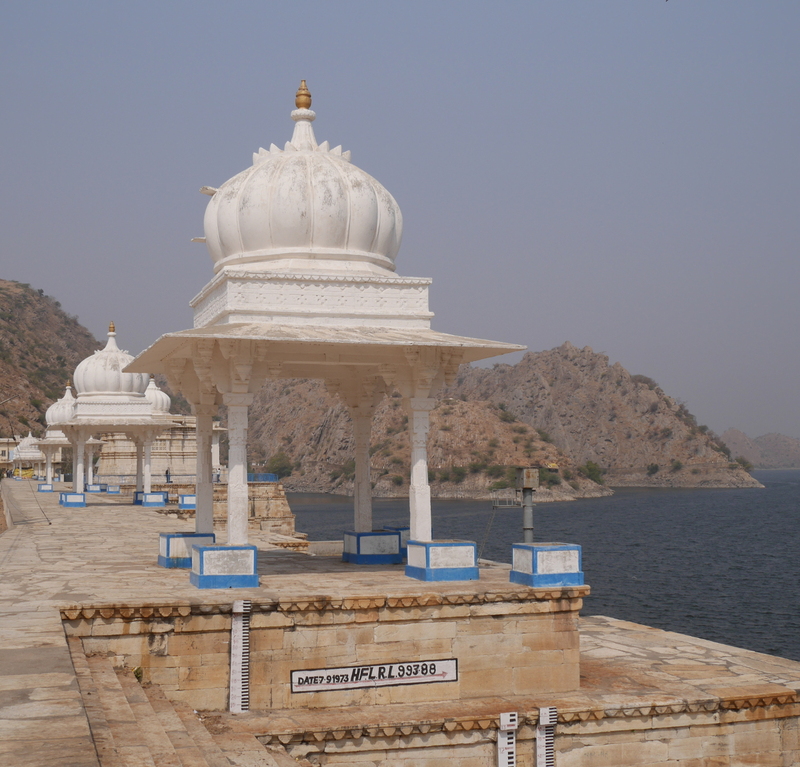 Jaisamand is accessible from Udaipur by Banswara-bound bus from the main government bus terminal near Udaipol. The dam and the lake are just up the hill from Jaisamand town, where the bus stops. Boat rides are available from the dam, at Rs 600 per boat for a half-hour or Rs 1200 for the full hour. On a hill just above the dam, a ruined palace stands on forest department land. Visitors can get permission to climb up to the palace from the forest department office, with payment of a fee. I thought the rate for foreigners of Rs 300 was ridiculously steep – even without the additional Rs 900 camera fee – so I opted out of that experience. I recently watched the 1959 British movie North West Frontier, which was released in the United States under the title Flame over India. The movie is about a team of colonialists (including one American, played by Lauren Bacall) who, along with a couple of trusted Indians, spirit a rajkumar (prince) out of harm’s way when a native state is overwhelmed by rebels in early twentieth-century India. Most of the action takes place in and around a train, powered by a shunting locomotive, which is used to bring the prince to safety. I must say that I enjoyed the film for the most part. With one very notable exception, the movie holds up well after all of these years. The plot is interesting and the pacing is particularly good. There are also some impressive location shots. The plucky locomotive that saves the day in North West Frontier. My favorite part of the movie is the first ten minutes, during which the rebels attack and kill the raja, while the rajkumar and his caretakers narrowly escape. Hundreds of refugees swarm into the British fortress before the doors are forced shut, leaving hundreds more stranded outside. The scene is dramatically shot, with a huge cast of extras. Except for opening narration, the first ten minutes have no dialogue. The action carries the story forward. Even though the story is set somewhere in the North-West Frontier Province, now part of Pakistan, the opening scene was shot around Jaipur, in the Indian state of Rajasthan. It is very identifiable for those familiar with the area. 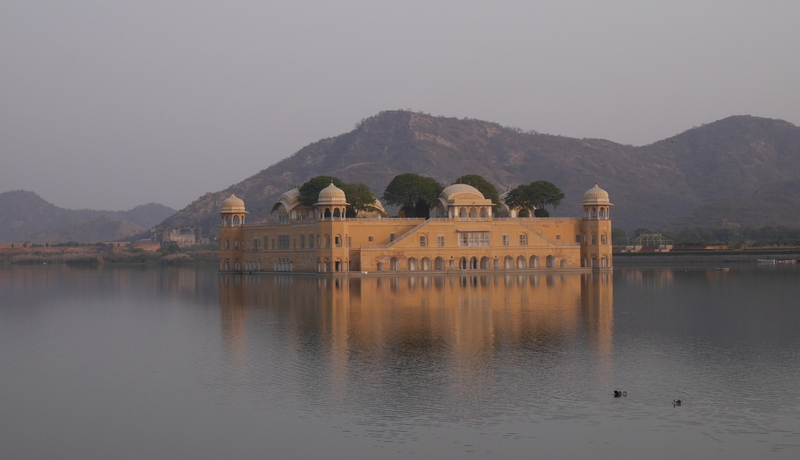 The raja’s palace is Jal Mahal, an iconic lake palace visible from the road to the old capital of Amber. In the 1950s, the lake was low and Jal Mahal stood on dry ground, allowing the stuntmen rebels’ horses to gallop right up to it. Since then, the dam has been refurbished and the palace once again appears to float in the lake. Jal Mahal Sagar, missing much of its water. Jal Mahal after the restoration of the reservoir. The British fortress is none other than Amber Fort, one of India’s most famous castles. It was built over the course of a more than a century, starting in the 1590s. In 2013, UNESCO declared it a World Heritage Site. Refugees on the path to Amber Fort. The courtyard of Amber Fort. Also in Amber, there are views Jagat Shiromaniji Temple (built 1599-1608), Charan Mandir, and a lake behind Jaigarh fort. The heroes at Charan Mandir. A rebel gunman scenically located in front of Jagat Shiromaniji Temple. A lake behind Jaigarh and Amber Forts. The heroes’ approach to the British fort gets a little distracting for those familiar with Amber, because they take a route that doesn’t make sense. They head north through a valley on the back side of the fort, then cross the ridgeline south of the fort, and yet somehow manage to arrive at the front gate on the east side. Most of the train scenes were actually shot in Spain, although the Spanish landscape is enough like Rajasthan to be believable. The train spends plenty of time passing through a valley that made me think of taking Amtrak through the California Central Valley, with the high Sierra in the background. The one respect in which the film is really dated is its religious stereotyping. The rajkumar, Prince Kishan, is Hindu; the rebels who storm his kingdom and slaughter his father are Muslims. The rebels intercept the train at various points in the story, sometimes galloping up on horseback like Comanches in a western movie. There is also a Muslim character on the train, who turns out to be the story’s chief antagonist, apart from the faceless rebels. Mr. Van Leyden is a journalist who insinuates himself into the train’s crew. After he refuses whiskey, another character asks him if he is Muslim, and he admits that he is. He claims that he is of mixed Indonesian-Dutch heritage – hence his name. The story leaves it unclear whether this is actually the case, because later Van Leyden claims to be half-Indian and fighting for the freedom of his nation, an all-Muslim nation. In his makeup for the role, Herbert Lom, the Czech-born actor who plays Van Leyden, looks credibly half-Indonesian. He does not look half-Indian. Herbert Lom as the menacing Mr. Van Leyden. From his position in the train’s crew, Mr. Van Leyden tries to assassinate Prince Kishan. He fails and is defeated in the film’s climax. If Mr. Van Leyden really is half-Indian, the stereotyping of Indian Muslims all as rebels is bad enough. But if he is half-Indonesian, then this is most problematic because it suggests that all Muslims are like him and have a similarly violent nationalist or pan-nationalist agenda. Mr. Van Leyden is the one postcolonial voice in the cast. When the British leader of the expedition, the daring Captain Scott (Kenneth More), dismisses the rebels as children, a standard colonial trope, Van Leyden retorts that they are grown men – uneducated, yes, but men nonetheless. Van Leyden represents the educated, privileged elite of colonized nations, who were proud of their nation but had also absorbed colonial critiques of it. The character has several good lines in the movie, but unfortunately his ideas are all discredited by his revelation as the villain. No Muslim characters are portrayed positively in the movie. That this movie isn’t just a colonial fantasy becomes clear in one scene. At the beginning of the movie, the last regular train makes it out of the besieged city; later, the special train carrying Prince Kishan comes across the first train stopped at a station. Its passengers have been killed to a man. Lauren Bacall’s character walks through the three train cars, full of corpses with flies buzzing about them, as vultures flock overhead. The scene is dramatic, and part of what makes it so chilling is how real it is. The film was made only twelve years after Partition, when exactly this happened. In the movie, Muslims kill a trainload of Hindus. In real life, adherents of both religions killed members of the other religion in huge numbers. In the movie, Hindus are portrayed as totally nonviolent – or in the case of the soldiers on the train, acting only in self-defense. As history would show, Hindus could be just as violent as Muslims. It is this bad portrayal of Muslims that has kept North-West Frontier from becoming a classic, and rightly so, because in America and India (and definitely other parts of the world), the last thing we need is more negative portrayals of Muslims. It’s a shame too, because the film is good otherwise. Over the past two weeks, I have read with bewilderment as news has unfolded about a spate of catastrophic floods that struck the Garo Hills in Meghalaya state of northeast India. The Garo Hills have a special significance to me, because I spent nine months teaching at a school there, five years ago. 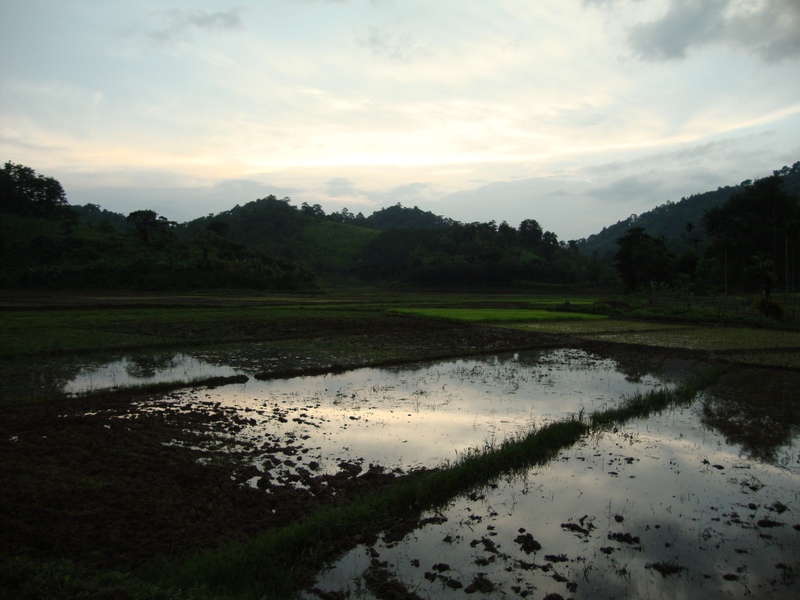 I knew the Garo Hills mainly as a quiet place of farms and jungles, and friendly but reserved people. It is hard for me to imagine it as the site of a major natural disaster, and harder still for me to read about the destruction thousands of miles away without being able to do anything about it. In the predawn hours of September 22, catastrophic floods struck parts of the Garo Hills, particularly the outskirts where the hills meet the plains of the Brahmaputra River Valley. According to the local and regional news, the floods are the worst in the hills’ recorded history. The rivers that flow down from the hills swelled from late monsoon rain and found new channels. The floods washed away almost everything in their paths, destroying huts, toppling trees, wrecking crops, and even demolishing some brick structures. More than a thousand villages were submerged, and fifty-six people lost their lives. The floods disrupted the transportation and communication infrastructure of the Garo Hills. Landslides blocked NH-51, which is the main road to Tura, the Garo Hills’ largest town. The population of Tura depends on regular shipments of goods coming up on trucks from the plains below. At one point, the Shillong Times reported that Tura had stocks of rice for seven days and sugar for only four. Indian Air Force helicopters airlifted medical supplies into Tura, but since the town has no airport for fixed-wing aircraft, a full-scaled resupply airlift was not possible. Fortunately, relief crews were able to reopen the road before supplies in Tura reached critical levels. Also affected was the Meghalaya electric power grid. The state’s grid runs entirely on hydroelectricity. Barapani Reservoir, near Shillong on the eastern side of the state, feeds water into the five-stage Umiam-Umtru Hydroelectric Project. In other circumstances, the heavy rainfall could have been a boon, as it filled Barapani to capacity. For the first time in several years, the Meghalaya Electric Corporation Ltd. was forced to open the spillway of the dam to prevent the reservoir from overflowing. At the same time, though, the floods damaged the state’s transmission infrastructure, leaving many areas incapable of taking advantage of the electricity. Some of the damage has proven difficult to repair. In Bajengdoba (where I lived and taught), the substation was flooded and powerlines washed away. Local boys and young men have volunteered to help the state authorities erect new powerlines, but according to the latest reports I have read, electricity has yet to return to Bajengdoba. Although the immediate danger of the floods is past, the hazard of epidemics, particularly malaria, remains. Even after the monsoon ends, the hills dry out, and the mosquitoes die off for the winter, recovering from the floods’ destruction will be a continuing project. I have no doubt that the people of the Garo Hills will dig out and rebuild, but it may take years. In this work, I wish them all the best. A Bajengdoba sunset in happier times (July 2012). © 2009-2019 by Willy Logan. All rights reserved.